“Another Mill From Peugeot.” Archie Vicar takes a closer look at the latest offering from Peugeot – the 505. The Monthly Car Review February 1979. Photos by Parker Pettiswode. Here are two items about Peugeot’s famous saloon, the much-loved 505. It is viewed as an icon today and has a strong classic following. If you see an older Peugeot on the road today, chances are it’s a 505 in immaculate condition. These two articles show how the motoring press received the car. The test drive took place (as of going to press) some fifteen weeks ago. Since then I have found myself polishing shoes and trying to think of an opening paragraph. I shared Boxing day luncheon with my nephew who wanted some advice. I spent most of the meal wondering how I would describe the car (the 505) instead of offering sound counsel. With a quiet pipe of Old Latakia and a few pints at the Bishop’s Head pub in Great Malvern (eight weeks ago) I wondered if it would be permitted simply not to review the car at all. It will sell itself without me. But Peugeot laid on a fairly pleasant jolly for us in Paris. And my editor has a six pages to fill so I began feeling terribly obliged to type a little bit. That was the state of my mind four weeks past. There the matter lay until my editor called (mid January), threatening to cancel the expenses claimed for travelling to the Peugeot’s launch. Deep breath. Seldom do I encounter a car so simply and profoundly excellent that I can not quickly set down my responses to it. I’ll have a bash anyway. The Peugeot 505 (left) replaces the 504 (below left), and will assist the respected 604 (top front, clockwise from bottom) in the larger-car sector. Let’s have a look inside. Having settled into the 505’s neat cockpit one notices how handsomely styled it all would appear to be. 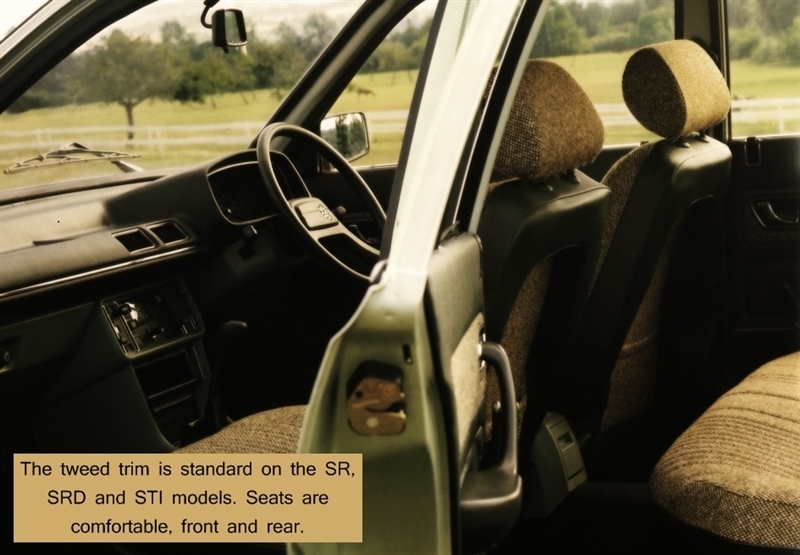 The tweed seats and brown trim look smart and less confrontational than offerings from a certain other French marque. The 505 is just a shade narrower than the 604 but the seats grip more assuredly. With a few turns of the key I fired up the motor and set out to find a stretch of the worst pavé I could find to assess Peugeot’s progress in the ride-quality department. I steamed off to the Le Restaurant Grenouille in Montmartre where I had once noticed some astoundingly bad paving while resting after spending some time with M. Pernod. Having found the street again, I roved back and forth, looking for the last parking place in Paris. The car performed commendably! Up front are McPherson struts with double-acting telescopic shock absorbers. Anti-roll bars are fitted at both ends. At the back are semi-trailing arms (with coils). Thus equipped the car coped with the shocking paving of Paris which means it ought to be able to cope anywhere in its worldwide market, possibly even in the notoriously difficult US market. The 505 has a longitudinally mounted engine and it’s oversquare. The crankshaft has 5 bearings and the cooling fan is self-engaging (aren’t they all these days?). The cylinder block is cast iron, explaining the 2645 lbs weight. Ford’s stripling, the Granada weighs a mere 2612 lbs. I tested the 505 in SR specification, assuredly the most popular choice for the middle-ranking businessman market. The engine is a carburetted 1971 cc unit which produces 96 horspower and 118 ft lbs of torque (trumping the wheezy Granada’s 111 ft lbs). In manual form, Peugeot claim that the car can return 29 mpg at 75 mph. During a steady drive around the Péripherique I managed a more realistic 26 mpg. The fuel tank holds 12.3 gallons, allowing 320 comfortable miles between feeds, perhaps more if you drive cautiously. I was unable to record any acceleration figures but the quoted 12 seconds to 60 mph sounds credible. Importantly, the car can push ahead and keep up with the rest of the charging executives rushing to meet month’s end targets. The engine drones a bit, especially at cruising speed. Perhaps a fifth gear would be handy, but again that’s reserved for the TI and STI models. Most competitors make do with four anyway. The saloon deploys Mastervac power assisted disc brakes at the front, drums hindmost. Only the more expensive TI and STI have rear discs. The brakes work very well: as an example of this, I motored to Versailles where I wanted lunch at the Bistro Petit Guignol. Their stewed ox-kidney (in wine with mushrooms) is legendary. However, a roadside sign at a truckstop promised cassoulet for only 12 francs so I made a lightning-fast decision to stop there and then. The car pulled up straight and without fuss. So, that was lunch. I realised it had been a while since I’d tucked into a really good braised shin of beef. It’s a cheap and tough cut of meat but handled well, it can be corking. In a sense, the Peugeot is like this. The car is a straight forward saloon but all aspects of its design and construction have been handled with consummate skill. There´s a friendly hotel in Nantes called the Duc D’Orly where braised shin is superbly prepared and well worth the 260 mile trip. I meandered out of Versailles, feeling quite fresh despite the very sizeable brandies that had rounded off lunch. Underway, I decided that the steering, a rack and pinion system, which is power assisted on all models is pleasant and very well balanced. 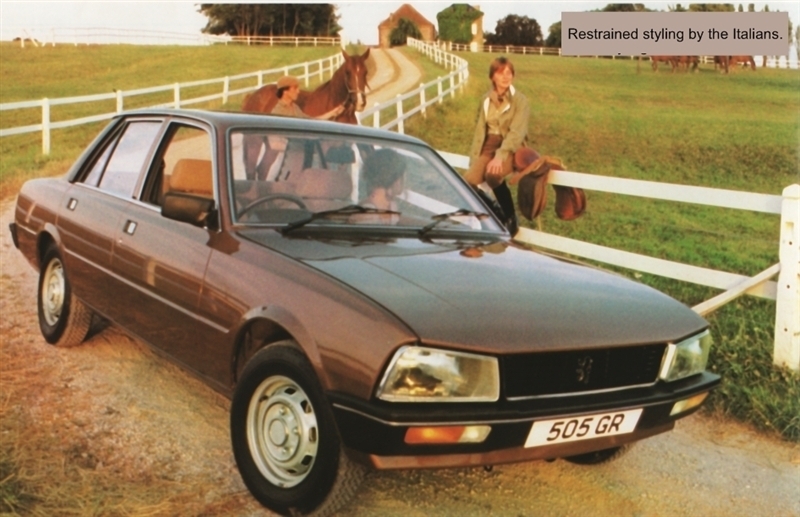 Compared to the porridge from Vauxhall, the Peugeot’s steering astonishing and perhaps this is the 505’s best trait. Perhaps only Citroen, Bristol and Lancia might to do it better. That said, only motoring correspondents care much about steering. 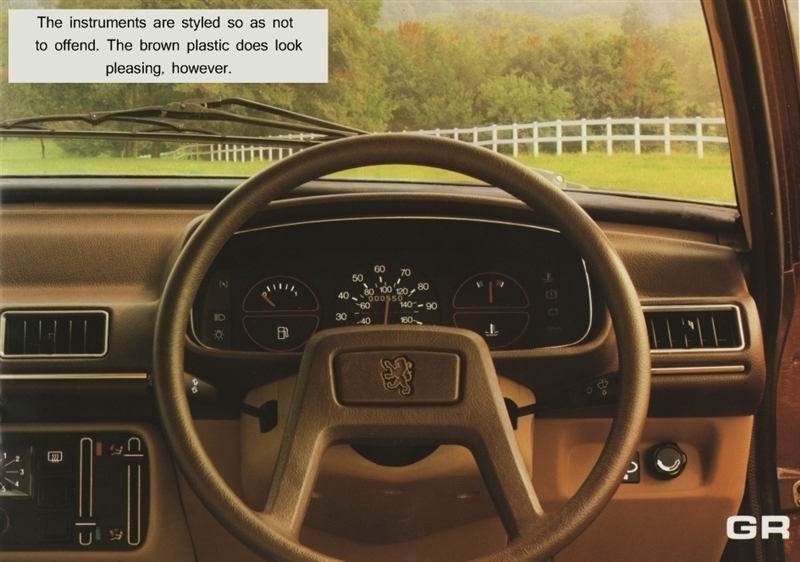 The ashtray was competitively sized but is placed directly behind the gearstick. For British market cars, this will be a constant nuisance while our continental cousins will consider the placement quite logical and natural. The route from Versailles to Nantes afforded a good chance to try the car on the open roads. The 505 feels well planted at normal speeds. On the limit, the rear-drive 505 presents a smidgin of understeer but if you lift off the throttle suddenly, the tail loosens and some perceptible oversteer makes itself felt. The steering signals this by lightening. It takes a mere flick of opposite lock to correct this or, alternatively one can open the throttle to adjust the 505’s attitude. It seems here that while the car looks strikingly restrained there is a streak of the same sporting behaviour that makes the BMW 518i the choice of pushy professional men today. The 505 can behave like a driver’s car, a detail to give BMW, Alfa and Triumph cause for pause. The Duc D’Orly lived up to my expectations concerning the wine list as well as the quality of the fodder. The Chateau Montbrun ’65 pleased me especially, being a profound wine, resonant in its velvety richness. Alas, I had the pleasure of the last brace of bottles in the cellar. And it was in pursuit of a case of this vintage I found myself following a challenging route across the backroads of the Loire to Poitiers, through the Hauteurs de Gatine hills. I was told there was a wine dealer there with one or two cases available. Viewing the rutted, bucking lanes from the driver’s seat it seemed that I would be shamefully returning yet another test-car with a torn sump or severed exhaust system. Rather impressively, the 505’s ground clearance kept the underbody above the very worst of the road’s protrusions, even with a photographer and twelve bottles of wine on board. Over this arduous route, the 505 kept up a creditable pace and I can only conclude here that Peugeot’s North African market has been borne well in mind. Fuel consumption dropped to 25 mpg. Peugeot have produced a car that, considered in isolation, is fiendishly cleverly conceived. Even with three months’ hindsight it’s nigh on impossible to say quite what characterises the car. The 505 is a saloon with quite a pleasant appearance, quite efficient engines, quite comfortable seating, quite nice steering and a quite reasonable price. And it is quite well constructed. So, you might say it was merely average. But can it really be that simple? Have Peugeot in fact, played a very clever game where, instead of dazzling us with technology or breathtaking styling, they have decided to woo us with understatement of the profoundest kind?